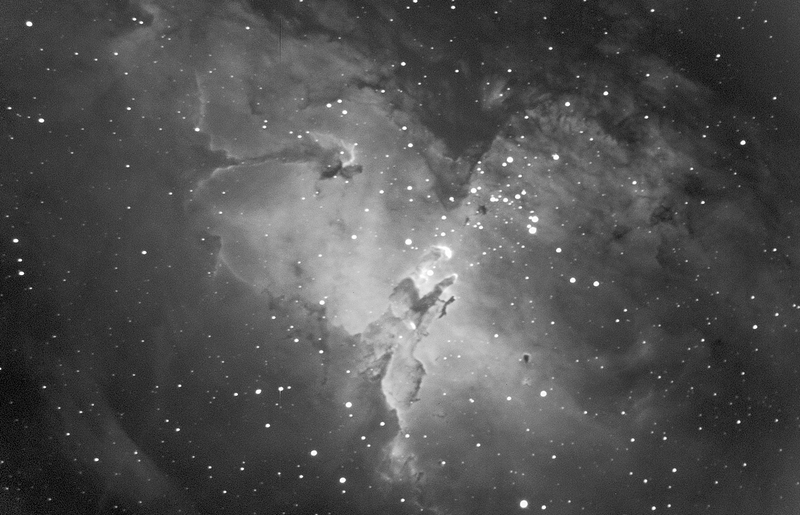 The Eagle Nebula, M16, is a great summer object. Located in Serpens just north of the constellation Sagittarius, the Eagle Nebula is located about 7000 ly from earth and is a bright emission nebula. The three central columns shown in this image are several light years in length and are composed of densely packed hydrogen gas. They create a star forming region within the nebula. This image is the combination of 4 x 500 second images taken in Ha. Therefore, only excited hydrogen gas is being imaged. The Cocoon Nebula in Cygnus in a stellar nursery / star cluster. The nebula is at the same time an emission nebula, a reflection nebula and an absorption nebula. The hydrogen gas which forms the nebula is energized to it glowing state primarily by the central star. This image is the summation of 6 x 10 minute exposures taken in the Hydrogen alpha band. This is NGC 7635 or "The Bubble Nebula". This is the heart of the Orion Nebula [M42]. This nebula is about 1/3 the diameter of the full moon and is easily visible through binoculars. 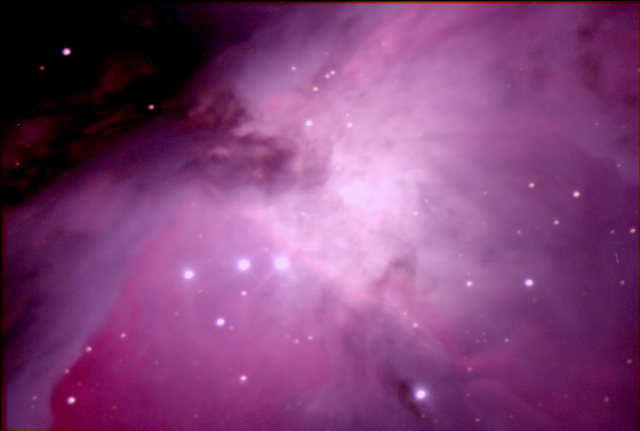 The Orion nebula, at a distance of 1500 light years, is one of the star forming regions of our local galaxy. This image is a combination of three images taken through Blue, Red and Green filters. The files were combined in the computer to produce this image. This is an image of M1: The Crab Nebula. The total exposure time for this image was 2.5 hours. The Crab Nebula lies at the eastern boundaries of the constellation Taurus at a distance of 6300 ly. A star at what is now the center of the nebula exploded causing a supernova on July 4, 1054 AD. Chinese astronomers recorded the event and called the occurrence a 'guest star'. The supernova was so bright, that for the following 23 days, it was visible to the naked eye during the daylight hours . There is also evidence that the Anasazi Indians, in what is now present day Arizona, may have also recorded the event in cave drawings. The nebula is still expanding. 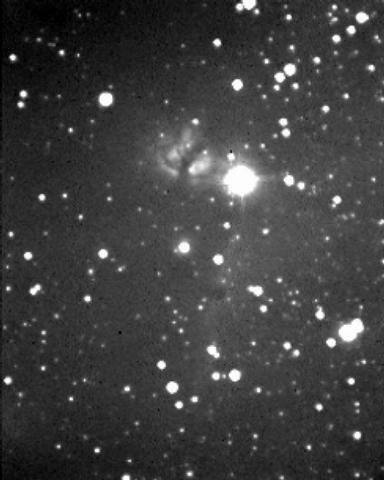 It is possible to measure the rate of expansion be comparing images of the nebula taken several years ago with present day images. See my paper on this measurement here. If you haven't guessed it yet, M57 is one of my favorite objects. This image of M57 was taken using the RC-16 scope at f/8.4 and the ST-10XME camera. The image is the sum of images taken in B, V, R, Ha and Clear. Each image was 10 minutes. The amazing point of this image is the dynamic range of the processing. 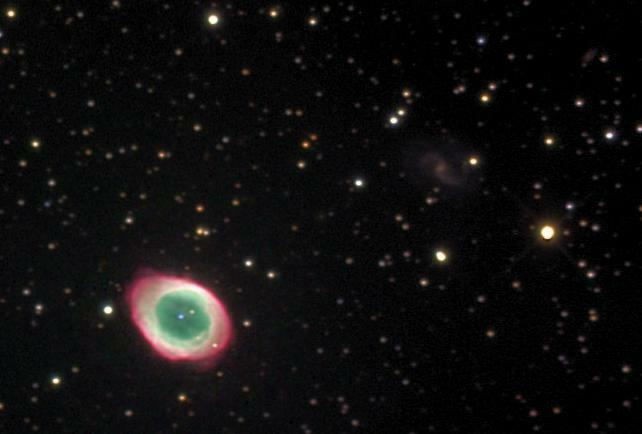 The Ring Nebula has a surface brightness of 8.8 mag, the bright star to the right has a magnitude of 10.4 mag, spiral galaxy just above and to the left of the bright star has a surface brightness of 14.3 mag and the faint galaxy in the upper right hand corner has a brightness estimated to be >22 mag. Al Kelly was kind enough to assemble and color balance the frames for me and created this beautiful image. Thanks, Al! This is what you do when there is lots of atmospheric haze and your ST-4 autoguider refuses to cooperate. You image through your spotter scope. This image was taken through a 60mm f/4.2 finder scope. The scope is not baffled and has some internal reflection problems but works in a pinch for CCD imaging. 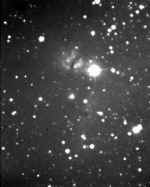 This is an image of the Horsehead nebula area of Orion. The bright star is Alnitak and is the far eastern star in Orion's belt. East is left and north is up. The structure just of the east of Alnitak is the Flame Nebula. The Horsehead nebula is just visible south of Alnitak.